"We don't just do market research. We go further." Orange Intelligence® helps our clients discover how to exploit, through our proprietary and unique methodology, their real estate assets by understanding its highest potential. We also deliver an effective and exhaustive business plan, a comprehensive design model and a thorough capitalization strategy. Orange Intelligence® is built around an experienced, multinational and multidisciplinary team that currently serves private and public sectors in their quest to understand the best value of their real estate assets. Orange Intelligence® also helps our clients conceptualize breakthrough real estate projects whose success is currently leading their cities’ transformation. With our proprietary methodologies, Orange Intelligence® strategically locates existing concepts for global companies, and delivers financial engineering, quickly making projects a reality, with market returns above the average leading benchmark. When performing market research, companies typically focus on analyzing market supply only, when they should be aiming to garner knowledge on the potential demand. This is highly relevant since it takes into account the habits of the consumers and leads to successful concepts and solutions. 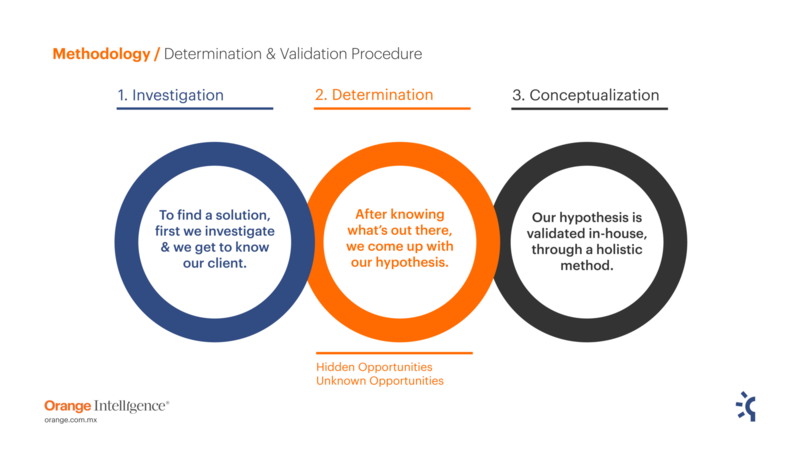 One important aspect of our proprietary methodology is that we take the time to understand our client’s profile by thoroughly analyzing and assessing their investment profile, expectations, financial risk and asset management needs. Our Detcon® Analysis Methodology finds hidden opportunities, as well as completely unknown market alternatives. We confirm our hypotheses through an exhaustive strategic plan that is supported by a financial model, thorough sensitivity analysis and an optimal capitalization, with a final phase of asset validation. Own a piece of land you’re unsure what to do with? Own a real estate portfolio and want to know how to exploit it?